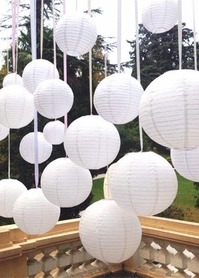 Paper lanterns are a simple, inexpensive way to light up a party or stage set. 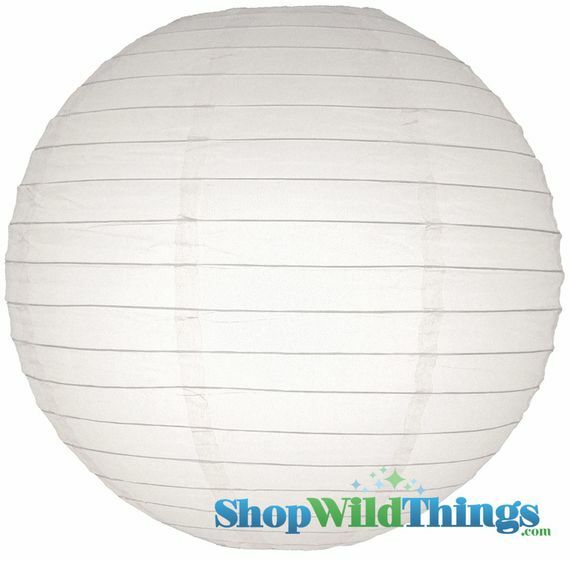 Our 6-inch white paper lanterns with wire hoops for hanging from ShopWildThings are easy to hang from ceilings, cluster in corner groupings or string outside for a dramatic look. Click on our video for a demonstration of how to combine a paper lantern with our bright white or warm white LED or plug-in lights. LED lights stay cool to the touch. They are a popular choice among professional event planners and production set designers for temporary installations and to set up on stages or in rooms without easy access to electrical sockets. You can also order our remote on/off control light systems. Change the look of a room by changing the intensity of the light. Create a dramatic moment when all lights are turned on at once for the arrival of a special guest or the start of speeches. There is a minimum order of 3 lanterns. 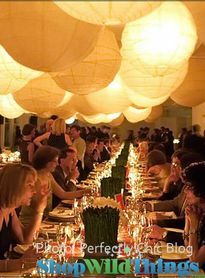 Fill air space with one paper lantern or clusters of paper lanterns in white or a mix of colors for extra flair. Illuminate an outdoors celebration. Create a pretty new lighting look for guest rooms or a screened-in porch. With LED Lighting inside, your paper lanterns become portable Decor for outdoor weddings, romantic evening parties, community festivals and school or church events.